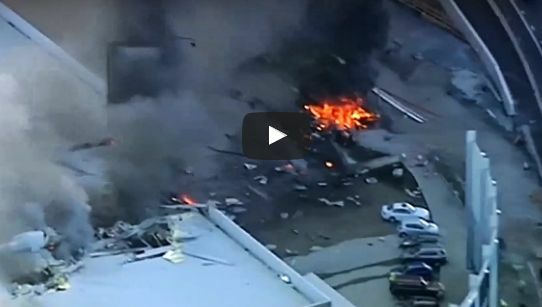 Five people have been reported dead after a small plane crashed into a shopping mall in Australia on Monday afternoon. Four of the people killed were United States citizens. Emergency officials in Melbourne say engine failure brought down the Beechcraft King Air plane, which witnesses said caused a fireball to rise from the DFO Center, near Essendon Airport. Both the mall and airport were closed as officials conducted an investigation. “At this stage, the advice we have is that there are no fatalities other than on the aircraft itself,” said Craig Lapsley, Victorian Fire Services Commissioner. Aside from some staff, the mall was empty and not yet open, officials said. Witnesses said the plane appeared to be coming in low and fast before they saw an explosion at the mall, which the plane hit the back of, sending parts of the plane as far as the Tullamarine Freeway, on the opposite side of the shopping centre. The plane was piloted by its owner, Max Quartermain, who had four U.S. citizens on the flight heading to King Island in the Bass Strait off the southern coast of Australia. The U.S. citizens were not identified because officials are still in the process of contacting their families. Breaking News @ Austriala;as the search of Malaysia missing Plane MH370 continues. FORMER BARCELONA COACH IS DEAD.